The first thing I thought about when I cam across Dave Morro Bay Keeling’s photo of an elegant tern with its catch was visual predation in the surf zone. On my home beaches, I frequently see terns, during the warmer months, mostly Caspians, cruising the surf zone. Occasionally one feints as though it’s seen something interesting, but I’m not sure I’ve ever seen one take a plunge into the surf. This makes sense – from the tern’s point of view, diving into the surf is certainly tricky and from the fishes’ point of view, the foamy swirling surf provides comfort and cover. Here’s the photographer’s account for the image above. Morro Strand beach, near northpoint. I watched this bird make probably 10 or more attempts to swallow this fish. Who knows how many attempts it had made before I noticed it. Ultimately, you’ll be happy to read, it was successful. The photo was taken on October 24th, and I initially thought the captured fish was a surfperch, maybe a silver, Hyprerprosopon ellipticum, or a walleye, H. argenteum. The range of both fishes spans the Pacific coast from Washington to California, and beyond, so that’s a fit. The silvery, laterally compressed body is also a fit. Upon further consideration, however, the deeply forked caudal fin, long pectoral fin, and the washed out bluish-grey dorsal loin are not good fits. So what is it? Any guesses? 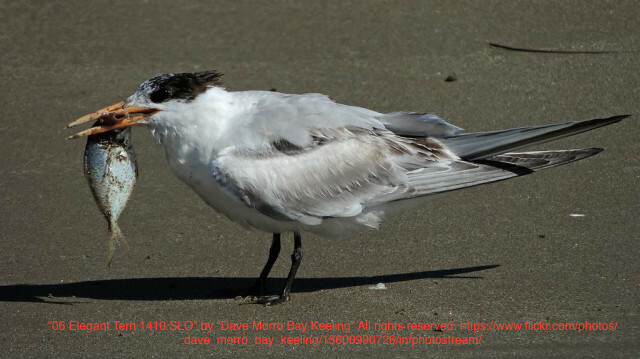 Elegant terns are fish eaters wherever they occur – we even have photographic evidence from the Morro Strand! That image got me wondering if, 900 miles to the north, Caspians plunge-forage in ocean waters just off my home beaches. From Shuford and Craig’s 2002 review I learned that there is a big Caspian colony in the Columbia River estuary, and those birds take a goodly amount of juvenile salmonids. This habit tends to get them in trouble with the salmon crowd. However, these apparently troublesome terns also eat a lot of anchovy, Engraulis mordax, herring, Clupea pallasii, shiner surfperch, Cymatogaster aggregata, and other silvery fishes. On the California coast from San Francisco southward, shiner surfperch, sardine, Sardinops sagax, and anchovy make up a big part of the diet. Thus, shiners figure big in the Caspian tern diet all along the Pacific coast. Above I show the shiner surfperch and two even shinier companions from our trawl catch in Monterey Bay back in fall, 2012. The pink was my first and I was excited to capture all three on our first set. You can read about that trip and meet some of my theoutershores colleagues in Surfperch Summit. Whenever I want to learn obscure stuff about Pacific coast fishes, I’m going to consult Milt Love; he rarely disappoints. For shiner surfperch predators, Love lists kelp bass, California halibut, harbor seals, California sea lions, great blue herons, western gulls, bald eagles, least terns, and Brandt’s and double-crested cormorants among the predators. For pinks he adds glaucus-winged gulls. For walleye surfperch, one of the silvery surfperch common along my home beaches, Love lists harbor seals, least terns, Brandt’s and doube-crested cormorants. Thus, silvery surfperches have a lot of predators to avoid. Let’s explore just a few attributes that help surfperch blend into their background to avoid being detected. Let us, however, not forget little Peprilus, the unlucky fish that got this whole conversation started, because much of what we will discover applies to butterfish too. 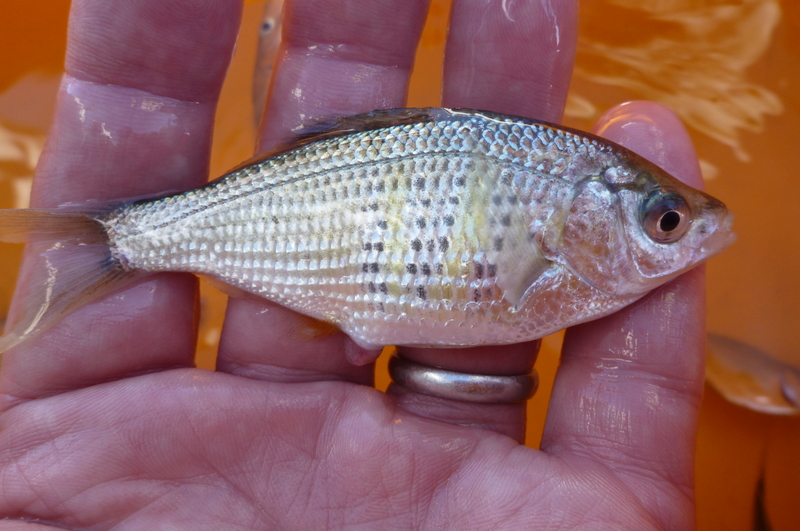 Silvery surfperch, those in the genera mentioned above, are like little swimming mirrors. Silver skin under clear scales acts like a mirror, reflecting the background. It’s arguably the best way, short of transparency, to become invisible in watery surroundings. The invisibility is improved upon when dorsal surfaces, where the light hits, are slightly darkened. This is called countershading. If you want to find out more about how silvery fishes blend in, take a look at “transparent scales” and “hiding behind mirrors” at Camouflage Under Water. 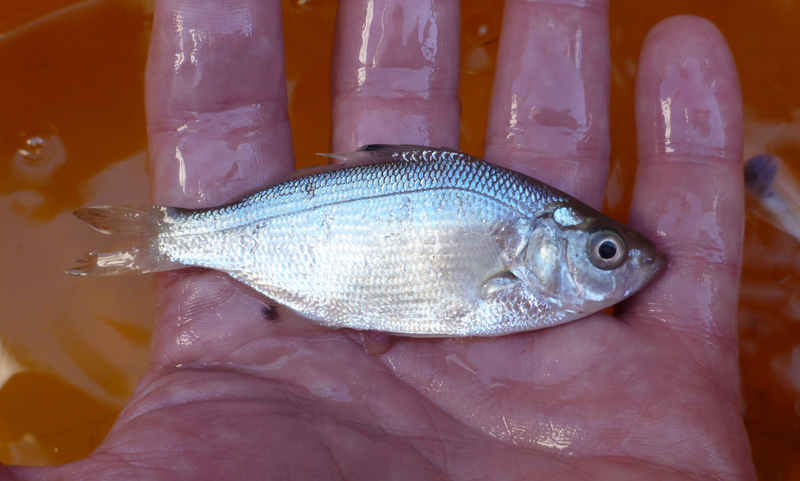 I once confined this male silver surfperch in an orange 5-gallon bucket. It was a dubious experiment, but I’m glad I recorded it with a few photos. Viewed from the side, he’s a swimming mirror, reflecting the orange of his temporary quarters. I also happened to record one more lesson about blending in. Viewed from above, the laterally compressed body (like a saucer standing on end) exposes only a slim surface to predators approaching from above, such as terns. 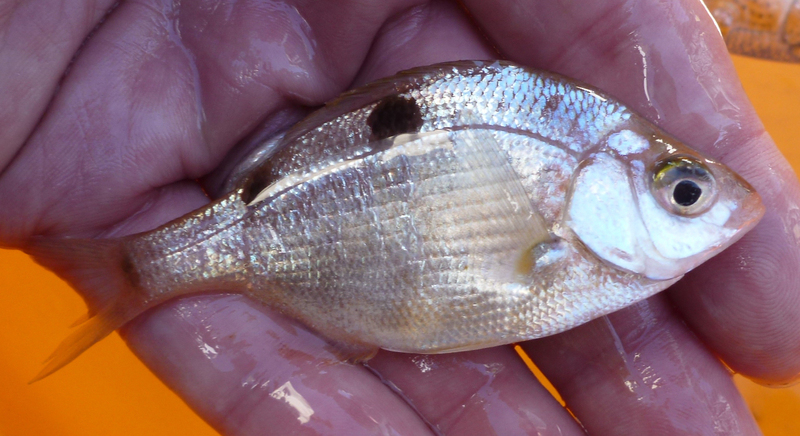 We have taken a quick look at some tricks that small silvery fish employ to blend in and presumably avoid visual predators. The tricks we listed are silvery skin, countershading, clear scales, and a laterally compressed body. I’m not saying these tricks are specific adaptations that impart protections compared to alternative colorations or shapes, but us humans love a “just so” story, and these features have been explored experimentally, to some extent, without being utterly rejected. Thus, for me, the adaptive story is a reasonable interpretation at present. Still, all these tricks to blend in met their match when Peprilus encountered the elegant tern. The same can be said for all the anchovies, herring, shiner surfperch and other silvery fishes taken by Caspians in the waters near my home beaches. Earlier I briefly alluded to the idea that true surf-dwellers probably have one more trick up their sleeves. Living in the surf probably complicates things for avian and possibly other predators. The surf zone is literally a rough and tumble place to make a living, but there are certainly less predators in the surf than there are in what we typically think of as protected waters. I thank Nancy Mann for bringing the photo of the elegant tern and prey to my attention, Dave Morro Bay Keeling for generously allowing me to feature his elegant tern photo and story, Ken Oda for helping me figure out the little fish was Peprilus, and David Leal who is always willing to talk birds with me. Shuford, W. D., and D. P. Craig. 2002. Status Assessment and Conservation Recommendations for the Caspian Tern (Sterna Caspia) in North America. U.S. Department of the Interior, Fish and Wildlife Service, Portland, OR. Thanks! Honestly, my original idea of a short note kept expanding like the Big Bang. Best thing for me, all the great naturalists that helped me. I’ve GOTTA tell you this yet again. 100th anniversary of Cooper Ornithological Society in Missoula. Howard;s there. I can’t remember what he was presenting but he throws up this, yes hand drawn transparency, on an overhead projector: Lines EVERYWHERE (maybe it was some sort of ethogram?). Anyway 15 mins. Then questions and Frank Pitelka raises his hand and says something along the lines of “Howard, that is the most useless, confusing mess I’ve ever seen!” No animosity, just friends telling it like it was: lots of laughter. Thanks! And thanks for sharing your observations of little terns diving in the surf. I’d like to see that myself. Maybe I can get down to southern California, maybe the least terns there do it, just like your little terns. And now you’ve got me thinking I should watch the Caspians out beyond the breakers too!